The AquaGuard has a reinforced PVC fabric making it possible to close a pool almost hermetically. Using a key switch the fabric gets rolled up behind the pool in a very short time making it possible to open/close a pool of 8x4m in less than 40 seconds. Integrated or as a top mount version, the AquaGuard is the perfect cover for new and existing pools! The AquaGuard is a real safety cover. We use a hydraulic mechanism avoiding electricity close to the pool. 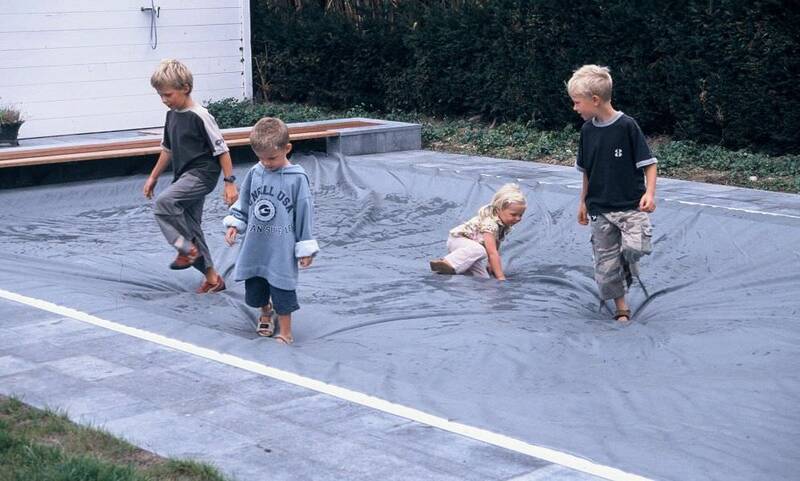 The fabric closes the pool almost hermetically and is not only safe for children and animals but also adults. Thanks to the buoyancy of the water underneath the cover, the fabric can hold a weight of several hundreds of kilograms. Furthermore, the AquaGuard is self-locking avoiding extra manual and time-consuming actions to secure the cover. The concept of an AquaGuard cover is similar to a sailing boat. In case of the pool cover, the fabric is pulled over the water surface using KEVLAR reinforced polyester ropes. The rope pulleys are installed at the track ends. To open the cover the fabric is rolled up on a tube behind the pool. Besides safety the AquaGuard offers other advantages such as keeping the pool clean at all times. As the pool is covered almost hermetically, the fabric protects it against leaves, pine needles, dust, …Furthermore UV is blocked minimizing algae growth and chlorine degradation. The pool water remains crystal clear and the use of chemicals is limited.